LaVetta Reliford, MSRS, RT(R) is the chairwoman of the Radiologic Department at Drexel University. 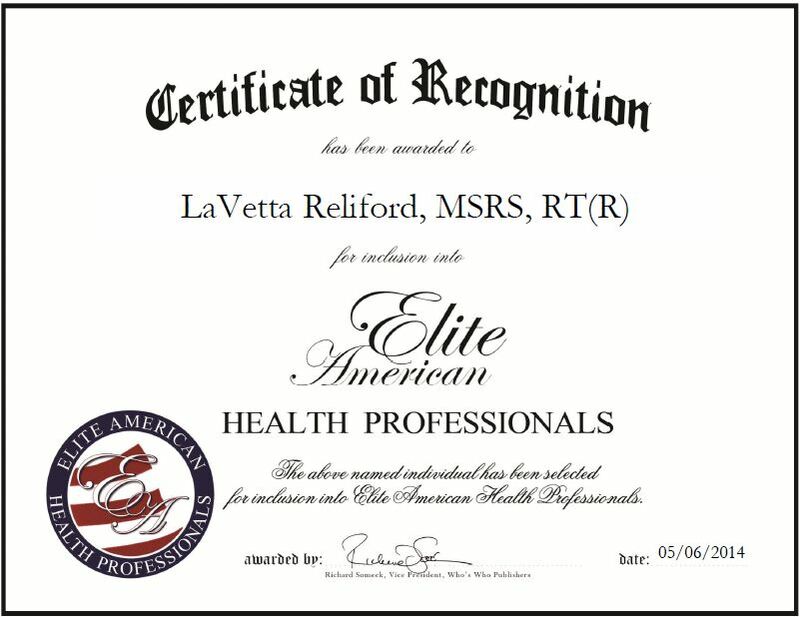 Ms. Reliford has been working at the university for 13 years and has more than three decades of experience in the health care industry. She considers herself a dedicated, resourceful and educated professional who has a proven ability to generate and monitor policies and practices that promote a safe learning environment. An expert in diagnostic and cardiovascular imaging, Ms. Reliford is responsible for overseeing the operations of associate and bachelor’s degree programs in radiologic technology. Ms. Reliford understands the value of a solid education and is currently pursuing a Ph.D. at Grand Canyon University. She has earned a master’s degree in radiologic sciences at Midwestern State University and a bachelor’s degree in health care administration at Ottawa University. She attributes her success to her love for the profession.